See bottom of this page for purchase information. So, what’s in the DVD? An introduction, which provides information on the creators of the genealogical material, a description of the material, a guide to use of the DVD, information useful in doing family research, a bibliography of family histories by people from Plain, and information on the story of the DVD’s creation. This is in pdf. format and can be printed as a booklet by the user of the DVD. George Ederer’s family pedigrees for 211 main family names and over 18,000 individual names. Otto Horz’s dissertation with information about 2,000 individuals who immigrated to the U.S.
Hanjörg Schneider writings about Waldmünchen emigration. Gary Haas's indexes to family names in cemetery and other records. The DVD, which can be played on any computer that has a DVD drive, can also be copied to the computer for faster access to the files and the DVD kept as backup in case of loss or damage to the original files. The DVD is for sale for $20.00 plus postage and might make a good Christmas present for family members. Sales are being handled by the Old Franklin Township Historical Society (OFTHS), which will use any profits from the DVDs to further historical preservation and family history projects. Copies of the DVD can also be purchased from the Kraemer Library and Community Center in Plain. Note DVD is not a movie to be viewed on your TV. It is for computer use only. Georg Ederer's pedigrees and notes for 122 main family names and hundreds more related families. Georg Ederer began genealogy work in 1973 when he saw old Catholic parish records and began making pedigrees of his own ancestors. Descendants of immigrants to Sauk County, Wisconsin, and elsewhere in the world, heard of Georg and requested information about their ancestors. 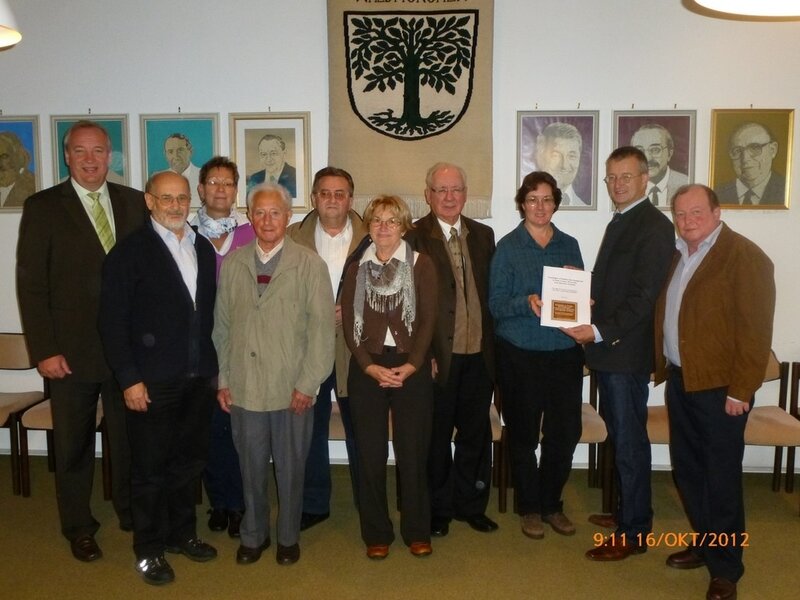 George conducted his genealogy research at parish archives in Bavaria and the Czech Republic. Otto Horz wrote a doctoral dissertation in 1939 at Philipps-Universität in Marburg-Lahn about emigrants from the county of Waldmünchen, Bavaria, Germany. The dissertation contains basic information for over 2,000 individuals and 400 family names that emigrated to Sauk County, Wisconsin, and other places in the world. Hansjörg Schneider form Waldmünchen wrote book and several essays about Waldmünchen area emigrants. Gary Haas, Norine Kraemer, Kraemer Brothers LLC., and "Good Idea Grant" sponsored by the Sauk County UW Extension, Arts & Culture Committee. Ken Kraemer, Debbie Blau, Christa and Willi Senft with an idea to preserve the pedigrees of Georg Ederer for future generations. Kenneth L. Kraemer is a native of Wisconsin and currently Professor at the University of California in Irvine acted as director of the project. Christa and Willi Senft longtime friends of Georg Ederer volunteered to scan the long scrolls and folders of pedigrees. Debbie Blau is a Wisconsin native with ancestral roots in the Plain/Spring Green area. She indexed the Ederer pedigrees and wrote the introduction booklet which includes directions for how to use the DVD files. Her husband, Georg, translated resident statistics of villages in and around the county of Waldmuenchen from the year 1867. Gary Haas a native of Plain, Wisconsin, presently living in Milwaukee, Wisconsin assisted with his computer skills. Check out the links of Gary Haas and Debbie Blau for more info. Click on the names Gary Haas or Debbie Blau and the link or website will open. The Old Franklin Township Historical Society will use the profits from the sale of the DVDs to further historical preservation of the museum and family history projects. To purchase a copy of this DVD click on the button at the right. Scroll to the bottom of the page to view, download and print a copy an order form.